The Running Red Riots certainly can be considered one of the best basketball teams ever out of the State of Maine. Rarely has a team boasted of so much talent from top to bottom. On this combine there were 5 full scholarship College basketball players and one scholarship Football player. In addition to those six, four others went on to also play at different college levels. This powerhouse team went undefeated while winning the Big 8 Championship, the Christmas Tournament, the Western Maine Tournament and the State Championship. They also defeated two of Connecticut’s strongest teams, Hillhouse and Weaver, by double digits in preseason exhibition games. 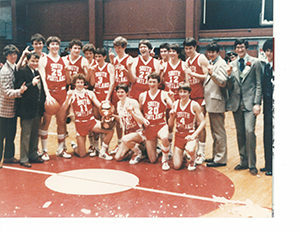 At the end of the season there were no New England Championship so the Maine State Legislature tried to pass a bill enabling the Red Riots to Play the Massachusetts Cambridge Ridge and Latin team with Patrick Ewing in a mythical New England championship game, unfortunately that idea was squashed by the MPA. This Red Riot team still holds many scoring records – 102 in the State Championship game,: 115 in a Western Maine Tournament game; Beal Gym record – 115; most field goals in a SP game – 52; SP records of scoring over 100 pts in a game – 7 , and in the 90’s -6, while having a scoring average of 87.22. Only twice was the winning margin less than 10 points. Huge winning margins were common place -32, 44, 50, 53, 35, 62, 36 43, 55, 50 to mention just a few; and finally 44 in the State Championship game. 12 +. In one game the reserves scored 44 points in the last quarter alone. Six players made the All conference team and two players were named first team All State , while 4 others ranged from 2nd and 3rd team selections to honorable mention All State. The Gatorade Player of the Year in the State of Maine was a Red Riot. Some of this State’s Basletball Gurus think that the 78 -79 Riots are the best team that Maine has ever had – that certainly is debatable because Maine has had some outstanding ones – but without question this team will always be regarded as one of the “Best Ever” because of their size and talent and outstanding depth. South Portland lost 5 or their first 6 players to graduation and still went on the next year to once again go undefeated and win the State Championship.